THURSDAY is Lenin’s Birthday. It will be celebrated around the world as Earth Day, a holiday begun by Democratic Sen. Gaylord Nelson in 1970 to keep anti-capitalist sentiment going after the Vietnam War ended. And of course this year’s celebration will feature at center stage, the global warming fraud. This entry was posted on Monday, April 19th, 2010 at 1:41 pm and is filed under UN AGW FRAUD. You can follow any responses to this entry through the RSS 2.0 feed. Both comments and pings are currently closed. Hmm. In 1970 no one knew that the Vietnam War would ever end — to accuse Sen. Nelson of trying to keep anti-war sentiment going suggests he had a better crystal ball than anyone else has ever had — and if he had, he’d have used it to end the war. He was trying to capture the community spirit of the anti-war movement, and turn it to longer-term, good use. What’s wrong with that? You totally missed the point of the cartoon, didn’t you. 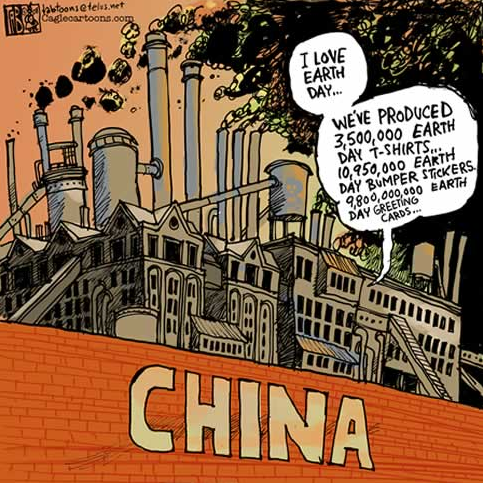 On one hand, you show us a cartoon with China pumping out pollution, allowed by the failure of getting an agreement at Copenhagen. On the other hand, you claim that image to be a fraud. Your left brain doesn’t know what your right brain is doing.